Our product names are often inspired by the New England region’s whitewater rivers. These distinctive native American names connote purity, ecological renewal, old fashioned Yankee industrial ingenuity and the raw natural power that emotes our aspirations for a clean energy future utilizing the simplest chemistries (water and electricity). We are proud of our region, its natural beauty, the inventiveness of it people and just as proud of the excellence, commitment and spirit of the Giner team. Our next generation commercial electrolyzer stack. Designed specifically for our lab scale hydrogen generator OEMs using the latest technologies developed for our larger products. Also popular with academic institutions and for use in specialty water electrolysis applications. The R&D version of our G5 comes available with cell voltage tabs and customizable MEA’s. 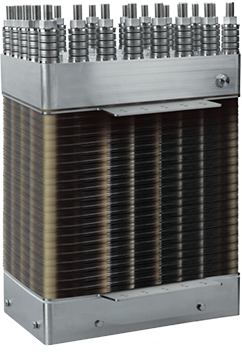 We are able to produce single cell to 20-cell Pemisewassett stacks that perfectly mimic the operation of our larger platform stacks at a fraction of the cost. Rated at up to 250 Amps this device has been a workhorse for our internal electrolysis development as well as NASA, DOE, and DoD programs. The largest commercially available stack currently on the market. This device offers unprecedented operating efficiencies at high current densities to provide the optimum price performance for our customers. The Merrimack offers world-class lifetimes with stable operating voltages. High operating temperatures and pressures minimize the size of heat exchangers, and post electrolysis compression equipment. Turn-down ratios of 10:1 and rapid ramp times enable demand management to the millisecond scale. New for 2016, Giner proudly introduces our megawatt scale stack. The Allagash platform offers the best-in-class price-performance in the production range from 30 Nm3/hr to 400 Nm3/hr within an extremely compact single assembly. The break-through rectangular pressure vessel design optimizes our material utilization while maintaining our market leadership in stack performance. Boasting a cell active area over four times larger than our Merrimack platform and fluid handling capabilities to match, we have not just broken but have shattered the $1,000/kW price barrier. The Allagash offers an exceptional combination of price, efficiency, scale, durability and packaging. 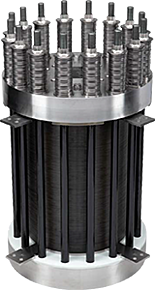 Already subject to many thousands of hours of laboratory testing, we anticipate that this stack will lead the hydrogen refueling station, power-to-gas, and power-to-product demonstration markets in the near term. 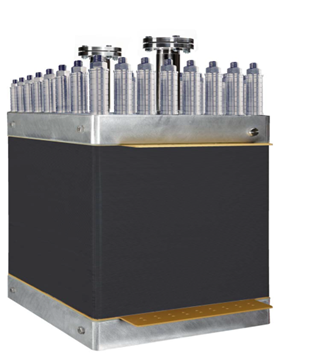 We are developing a range of large electrolyzer stacks to address the nascent power to gas and Power 2 MobilityTM markets. Giner’s Kennebec stacks span the range from 60 kg/day to 2200 kg/day (5 MW nominal input). Giner is driving PEM electrolyzer technology forward to meet the needs of tomorrow’s green hydrogen economy.